When we think of robots, we tend to think about the two major types: high-end robots and vacuum cleaners. Some examples of high-end robots include bomb disposal units, and radiation detecting robots. But iRobot CEO Colin Angle hopes to create a market for mid-range service robots. And what's better than a robot serving as your daily helper? That robot, named AVA, will be powered by Android tablets! The Android tablet, a Motorola XOOM in this case, will serve as the processing and sensory core, while the iRobot machinery underneath will provide the mobility and physical functions. Angle explains how the tablet and AVA came together: "We in the robot industry realized this is a fantastic head for a robot...what was missing was the body." With the front-facing camera, microphone, speakers, and accelerometer, the XOOM requires only the body and the programming. Some keen readers might remember that AVA was initially demonstrated with an iPad at CES. Angle explains that the change was made for features like voice and video chat. "We're tablet-agnostic...Right now, Android has what we need," explains Angle. 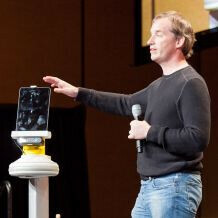 iRobot's hope is to sell AVA to developers this year, and enter businesses next year. And once the price comes down, AVA can enter homes, and provide everything from domestic assistance to virtual doctors' visits. its the same maker of the little circle robot irobot. iRobot makes the roomba. It has nothing to do with Apple. So it's a OK for an android tablet to power it. ya my bad... didnt realize this WAS the vacum company... haha but doesnt it seem funny they wud use a xoom and not just make their own tablet? More cost effective to strike a deal with a company making an existing, awesome tablet, which was probably bringing a better deal to the table than Apple (an example of Apple's offers being "Bend over and we'll take it from here. "), than to spend the time, money and resources needed to develop the tablet themselves. "We're tablet-agnostic...Right now, Android has what we need,"
One step closer to the HumancentiPad? Speaking of which...looks like he's trying to emulate (blow)Jobs with his outfit, minus a turtleneck.